Location: In the First Age, Lindon was Ossiriand, the southeastern region of Beleriand between the River Gelion and the Blue Mountains. After the Sinking of Beleriand, the name referred to the remnant of Ossiriand not sunken into the sea, the realm of Gil-galad. 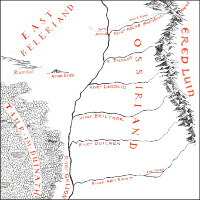 The Gelion region of East Beleriand, including Ossiriand (Lindon) and Ered Luin. [In] the days of the old world of the First Age... the forefathers of the Edain... crossed the Blue Mountains into Beleriand, of which Lindon is all that now remains. 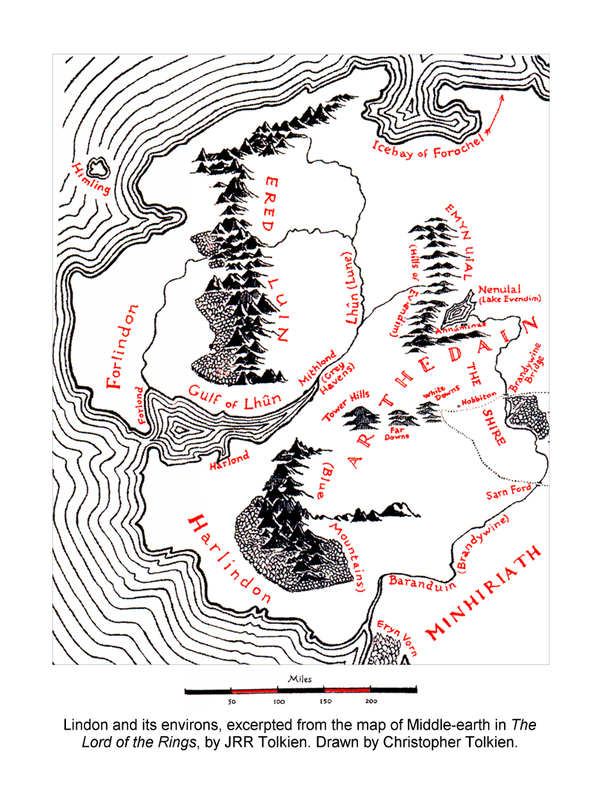 A map of Beleriand and Middle-earth, showing which lands sank and which remained. The Lindon region, including Ered Luin, the Blue Mountains. 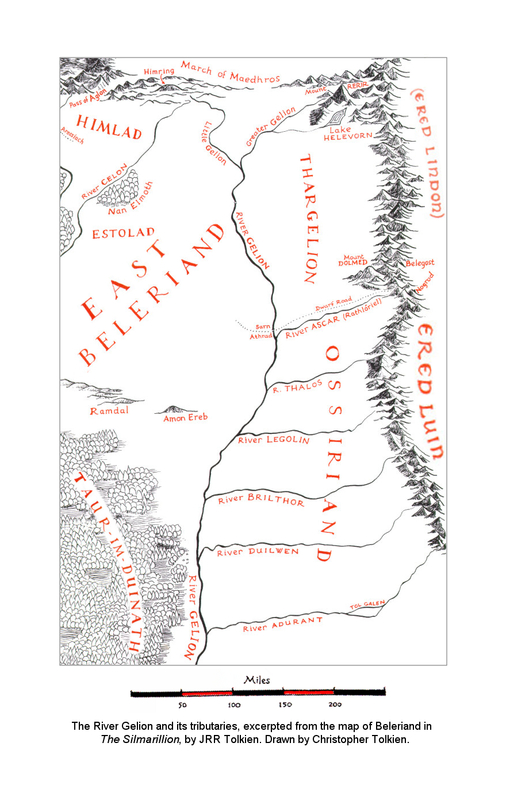 [The] Exiles 2 (such few as remained)..., held still to Lindon, the remnant of Beleriand west of the Ered Luin. There Gil-galad was their lord, until the Second Age drew to its end. In Lindon Sauron had as yet no dominion. [It] is said that... Elendil... escaping from the fall of Númenor came at last to the mouths of the rivers that flowed into the Western Sea. And Elendil..., came to Lindon and dwelt there a while, and passed into Middle-earth and established a realm in the North. At its greatest Arnor included all Eriador, except the regions beyond the Lune, and the lands east of Greyflood and Loudwater.... Beyond the Lune was Elvish country, green and quiet, where no Men went; but Dwarves dwelt, and still dwell, in the east side of the Blue Mountains, especially in those parts south of the Gulf of Lune, where they have mines that are still in use. For this reason they were accustomed to pass east along the Great Road.... At the Grey Havens dwelt Círdan the Shipwright, and some say he dwells there still, until the Last Ship sets sail into the West. In the days of the Kings most of the High Elves that still lingered in Middle-earth dwelt with Círdan or in the seaward lands of Lindon. If any now remain they are few. lin- This root, meaning 'sing, make a musical sound', occurs in Ainulindalë, Laurelin, Lindar, Lindon, Ered Lindon, lómelindi 3. 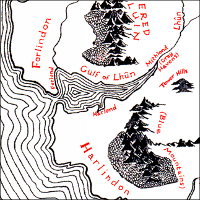 1 The map drawn by Christopher Tolkien in The Lord of the Rings names Forlindon as the part of Lindon north of the Gulf of Lune (Lhûn), and Harlindon as its southern counterpart. 3 lómelindi Quenya word meaning 'dusk-singers': nightingales.